When you first meet Dr. Mamta Patel, it’s instantly obvious how bright she is. Add to her intellect a passion for what she does and the ability to relate easily with kids, and you get a shining star mentor. These qualities were not lost on NASA, and they recently asked Patel to head up a new program called NASA G.I.R.L.S. (Giving Initiative and Relevance to Learning Science), which is part of the Women @NASA program. importance of role models, and making STEM (Science, Technology, Engineering, and Math) careers interesting, relevant and relatable to kids’ worlds. As a NASA cooperative education student at Johnson Space Center in Houston, Texas, I became involved in their education outreach ventures. Soon, these events became a pillar of my life — that is to show young kids the possibilities in life, in school, and in science. I found that kids seemed to easily relate to me, and ten years later, I am still visiting schools. I am a member of the NASA Speaker’s Bureau but I also accept nearly every informal invitation I receive to speak to classrooms in the Washington D.C. metro area. I have spoken in the greater Houston region and College Station, Texas too. Recently, I began to lead a new initiative between the White House Council on Women and Girls and NASA. The Women@NASA project is my first full-time professional dedication to an education outreach venture (previously, I worked in engineering), and I cannot adequately describe the joy in being able to impact young girls and encourage them to pursue STEM careers. I think senior management at NASA would agree with me when I say that Women@NASA has reached more people in the last few months than since 2010 when we unveiled the new website. My mission when taking up the project was to take it from a website that showcased the stories of Women at NASA to a full-fledged program that actively engaged students and used the women on the site to influence young girls. The biggest result of my efforts has been a pilot project called NASA G.I.R.L.S. This project aims to virtually pair a Women @NASA member with a young girl anywhere in the country using commercially available video-based programs such as Skype or Google chat. I have been pleasantly surprised at how well received the project has been and the only promotion thus far has been through our recent social media venture (only 350 followers!). It’s been heart warming to see how far one Tweet can take a near-grass roots effort. The challenge we face is that STEM fields and associated degrees in universities are attributed to only 25% of the female population. This is not a problem in and of itself. Men are smart and do these jobs phenomenally well. However, the issues facing the world and our nation may be too great for only a small subset of the smartest brains. And it is no single person’s opinion that men and women think differently and approach problems uniquely. I fully believe the union between men and women is key to furthering STEM careers. Perhaps to find the cure to cancer or send us to Mars, we should tap into the market deeper than we currently do and encourage young girls to enter STEM careers. These young girls may be the innovators we need to help fix the maladies that threaten our population or advance us to the next century of technology. What I have learned is there are many people who aim to defeat the same challenge as I do. My biggest lesson thus far has been to collaborate. Joined forces have more power and reach. That’s why Women@NASA has partnered with the Girl Scouts of the Nation’s Capital and the Challenger Foundation for a seminar series version of NASA G.I.R.L.S. This is also why the White House has reached out to us to showcase our new NASA G.I.R.L.S. program. We may have similar goals and if we can join forces, we could potentially reach our target population more efficiently. Many tell us that the NASA G.I.R.L.S. project is a one-of-a-kind program for the grade 5-8 age group. In my research, I also didn’t see such a program. In this year’s pilot project, we strive to use virtual programs to link young girls with mentors at NASA. The key reason for such a project was to reach out to girls who were not located near NASA centers. This allows more people to share our mission and dream to innovate. We also have started our own social media effort with Facebook and Twitter. Our website is part of the Open Government Initiative and uses the commercially available WordPress to power it. In the next few months, we plan to release Android and Apple smartphone apps and join Pinterest as we believe our target population (females) is highly impacted by visuals. since we are government, but if there is a way, I will find it. While we know the education availability in other nations is not at the level to which we are so lucky to be entitled, I think it’s exciting that Women@NASA can reach out so far. We receive emails and comments from international students all of the time wishing they could be a part of our programs. I hope I can make some of their wishes come true one day. On a personal level, I did much work for Asha for Education, a group that funds education projects in underserved regions of India. I was president of the Atlanta chapter in 2006 and started Team Asha Atlanta, a marathon training and fundraising program. During that year, we raised the most ever by the chapter and sent 100% of the funds to projects in India. Asha is near and dear to me because I attribute each of my successes to my parents, who emigrated from India in 1978. They came from nearly nothing to ensure I, and my siblings, came from something. It is the thought of their life in an India so different from today’s India that drives me daily. It is the notion that fleeing the poverty of the 1970s India and picking up and leaving everything one knows, all for the potential of a better life for one’s children. That’s irrefutable love and support. So I feel it my duty to give to the young children of rural India and other underserved regions what I am blessed to have daily because of a risk my parents were willing and able to take over thirty years ago. We are lucky here in the US. We take for granted things we are afforded by merely being born American citizens. While we don’t do everything right, the US certainly leads the world in science, technology, and engineering. For example, while not ideal, the US does have the No Child Left Behind Act of 2001. Many nations cannot employ such an act. Sadly, even in our nation, many kids do not stay in school. There are numerous programs that target these kids and encourage them to stay in school and I think we need a better way to showcase them. For example, even I know they exist but without an Internet search, I couldn’t even name one. Perhaps, we could have a national repository for these programs. And if that exists, perhaps we can showcase such a repository better. After finishing my education and entering the work force, I think the future of education should include more hands-on learning. The senior design projects are great but why do we only employ them once in a four-year degree? Why does it have to be “extra curricular” to do an internship or co-op? Why can’t we integrate it into “regular” education requirements? My biggest regret was not doing a study abroad summer while in school. Recently, I made up for lost time by completing my first trip around the world on my honeymoon. Each country I visited reminded me that we lack global affairs education in the US. Political Science and international affairs majors are not the only ones who should be internationally educated. I applied for one program as I was graduating from my doctorate. This program funded a global affairs trip (through Rice University) and to my surprise, I was rejected. But it made me wonder, why don’t we integrate an international trip during college or high school? I bet numerous outreach programs would fund such a program. I fully believe my outlook post-world trip is completely different than before. I appreciate small things I never did before and I witnessed what my parents often described. It was humbling. Impacting. Inspiring. First: Hands-on. Hands-on. Hands on. Use as many projects as possible while maintaining curriculum requirements. Second: Relate science, technology, engineering, and math to changing the world and making a difference. Lots of young kids and girls in particular can readily understand how being a doctor or a teacher can impact the world or make a difference. But they often can’t see how STEM fields can. This is critical! Third: Relate curriculum to its use in the real world. Integrate young professionals into your lessons and ask them to speak to how they use math or history or science or English (and yes, we all use English in our everyday life!) in their real careers. Tech gadgets: They can be used for educational games. A fun way to teach. Social media allows young adults to learn the latest opportunities from the Girl Scouts, schools, education foundations, etc. They are a requirement to allow kids to maintain pace with the ever-changing world and to challenge them to advance our economy further. Tablets can replace books and ease the physical load on our children’s backs. Literally. Tech gadgets: They are distracting and often deter learning. They bring about new issues to deal with (i.e. sexting or vision issues from staring at a screen). Electronic advancement may mean the next generation has not learned how to interact in person. We as a society have to draft new ways of social morals — what’s okay and not okay when it comes to social media. Yes, I know. Many people say a computer, an iPad, a smart phone, or other technological gadget. But, I think a good teacher is the one tool that can make up for a lack of so much else. A teacher who cares and who goes the extra mile. A teacher who encourages kids to push the boundaries and take risks. Across the world, education differs greatly from one country to another and sometimes within the country itself. Often from one school to the next. What some tools can do in one place may not be successful in another. But to me, a good teacher is all you need everywhere. When was the last time you laughed? Why? This morning. Remembering a dream where my grandmother made an appearance. These happen rarely since she passed away in 2001, a moment I will never forget since her passing occurred while I was witnessing my first night launch of the US Space Shuttle. They are my favorite dreams because I wake up in a great mood, and those dreams are in Gujarati, my native language. For a moment in time, I have her back even in the backdrop of a ridiculous subconscious! Favorite book: Must I choose? 🙂 Reading is one of my ultimate past times. I am currently reading A Rope and a Prayer. I recently enjoyed reading the Hunger Games series, Harry Potter series, Tina Fey’s Bossy Pants, Khaled Hosseini’s books, Stieg Larsson’s The Girl with the Dragon Tattoo series, and Dancing in the Glory of Monsters: The Collapse of the Congo and the Great War of Africa. My recent most favorite read is The Help, and I fully believe it needs to enter English classrooms’ reading lists. My all time classic favorites may be The Great Gatsby and Les Miserables. 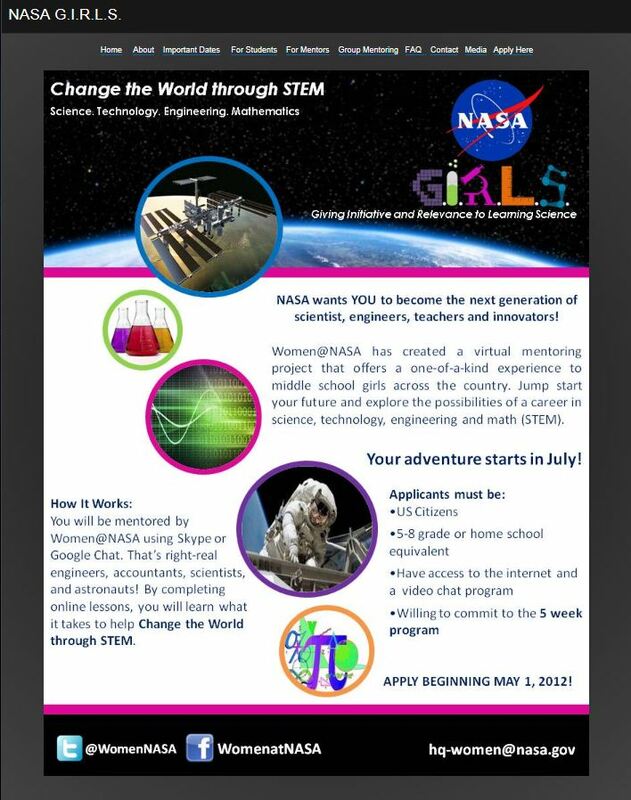 This entry was posted in 21st century skills, Information and tagged Education, Mentor, NASA, NASA G.I.R.L.S, STEM, Teacher, Technology, Women@Nasa. Bookmark the permalink.